The best time of year for fabulous, fun events and parties. Whether it be a glamorous day out to the races, your best friends wedding or a huge family BBQ. I LOVE rocking bright colours and feeling fab whilst sipping on a refreshing drinks and having fun! Mira Showers (yup that's right a shower company) recently contacted me and asked if I fancied trying out one of their Showering Perfection Kits - I am obsessed with showers and after looking at their website I thought it would be right up my pampering street.... and I was right. I'm very much a shower person - I have lived in my flat for nearly 2 years now and I could count the amount of baths I've had here on one hand... if any! I just love standing in the shower, washing away the day and all of my tensions and troubles! Showers are an essential part of a pampering session for me and I think big events and pampering come hand in hand really - there's nothing better than feeling brand new and getting glammed up. 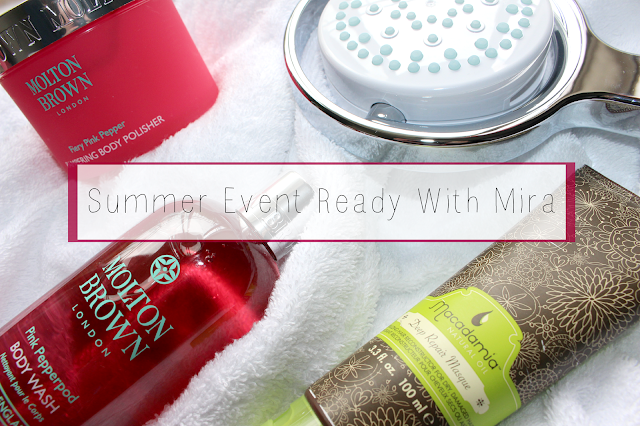 So alongside Mira's awesome 360 shower head* my kit included a gorgeous fluffy dressing gown* and a few beauty treats to help me feel refreshed and ready for a girly glam session! First up...this is legitimately the coolest shower head I've ever seen, especially in my own home! They work with any shower on any system which in itself is just a winning factor and has 4 different spray modes. Rain, Burst, Cloud & Storm - cute names right? All you have to do is flip the head round to try them all! There is literally something for everyone and for something you will use everyday I think the £64.04 price is totally worth it! I miss having a walk in shower like at my parents house and this makes having a shower in the bath a whole lot nicer. 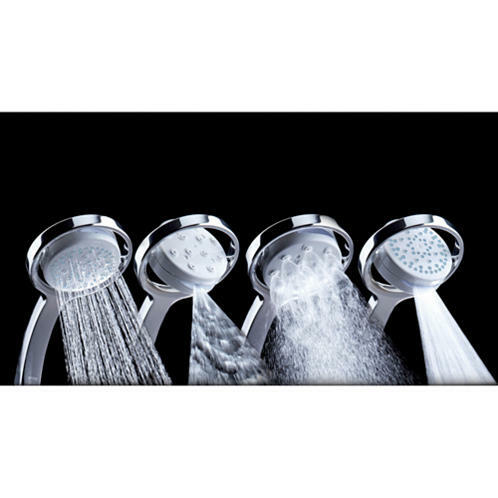 Mira showers are super cool and definitely worth a browse - check out all their products here. With that ready and raring for me I popped on my favourite shower music.... the Wicked soundtrack.... and hopped in to try out these highly exciting beauty treats. Hair masks are something I do regularly, having bleached hair isn't the best is it?... but I keep my hair looking and feeling relativity healthy and normal by treating it weekly. I have been wanting to try Macadamia products for years now and for some reason had never got round to it, until now. This mask is gorgeous, really rich and hydrating and it smells lovely! It left my feeling strong and repaired, one I shall be using before my next girls night out for sure. The Molton Brown bits are a total luxury to me - I normally stick to Nivea, Simple or Sanex when it comes to showering so having these 2 to freshen me up was a breath of fresh air. I really liked the scent and after using the body polish I felt even more ready to slap on some fake tan and doll myself up. Out of the shower and it was time to slip into that fluffy dressing gown that I mentioned earlier, pop a face mask on, paint my nails and grab a nice cup of tea. I want to say a huge thank you to the lovely people at Mira - you've definitely got me event ready with all these lovely bits and bobs! Now.... where's my fancy hat and summer wedges? I've been using Macadamia for years now, and I love the whole range. The repairing oil is awesome too, so try that! 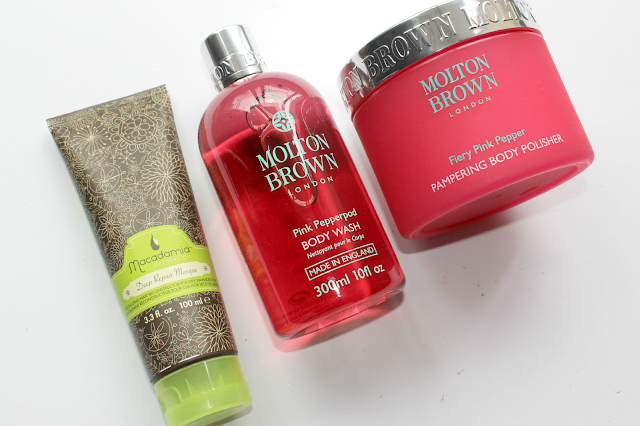 You can never go wrong with Molton Brown! I love their products!